as well; the new owners are building a house and will live there full time so the property will be loved and used. Parcel 77 is the premiere piece of property on the entire South T-Bar Ranch. Located just five minutes from the front gate of South T-Bar, Parcel 77 allows quick access, and yet offers quiet seclusion, away from roads and other properties. 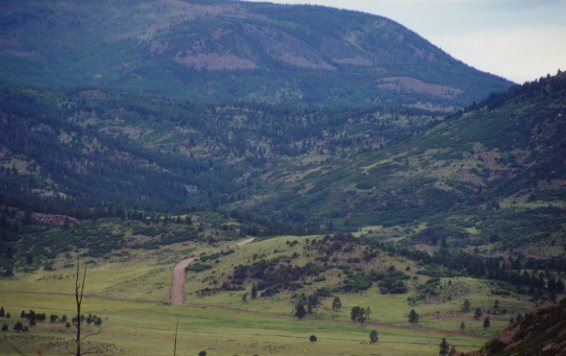 Located in the far northwest corner of South T-Bar Ranch, the property is bordered on the north by a Colorado school section which will never see development, and on the west by a 2500 acre private elk and game ranch… the most you see is elk and buffalo grazing on the ranch. The unique diamond shape and rolling terrain of parcel 77 insures seclusion and privacy, whether it is a choice for a home site or simply a secluded place to truly get away. The property consists of 37.96 acres of variable terrain, ranging from rolling meadows on the front of the property to stands of aspen and pine towards the northwest corner. A small creek runs through the property that normally flows year round; however, in the current drought conditions, it slows to a trickle in the summer months. The creek attracts much wildlife. The views from the property are stunning; to the northwest lies heavily forested mountain scenery, and to the southwest, lies magnificent views of the South T-Bar Ranch valley. Electricity and three telephone lines are available at the property boundary line, and like all parcels at South T-Bar, all utilities are underground. Good water is available underground, and the adjoining parcel has drilled a well that has a good flow rate. The photos below may give you some sense of the beauty and majesty that is South T-Bar, and parcel 77 in particular. This is a view down valley towards the open meadows on parcel 77. 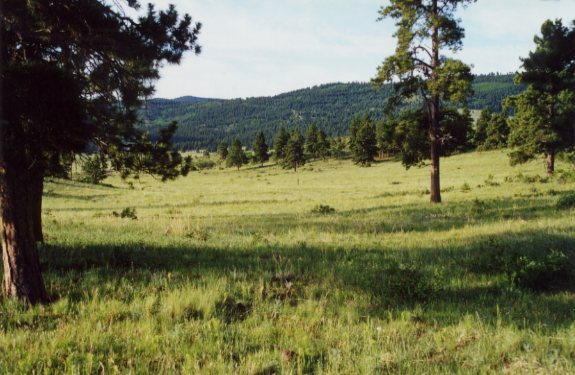 Parcel 77 is blessed with open meadow, heavily forested stands, and a mixture of both as you can see in this picture. A view towards the creek taken from the rise immediately above. If I had known I was going to sell, I’d have taken more pictures of the creek area. It is a small creek, and until this last year of Colorado drought, it ran year round, creating a wonderful area to explore. With the drought it becomes a trickle in the summer time, and nevertheless, a life sustaining source of water for all kinds of wild life. To sit near the creek in the evening is to see animals of every kind slake their thirst. This is a view looking into the northwest corner of the property. It is about 100 feet to the creek from the tree line, and we believe the spot is an almost perfect home site, providing privacy and seclusion while offering terrific views. This is a view of the property from across the South T-Bar valley. The parcel 77 boundary starts just past the bend in the road and heads northwest up the valley. The distinct line of trees is the creek. 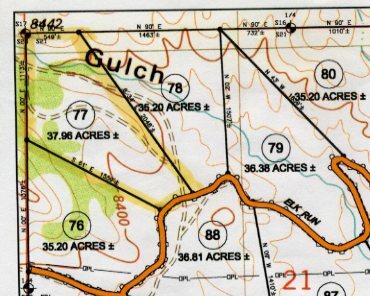 The map below shows the property lines. This is another view from the heights across the valley. The rock outcroppings are BLM land, and available to all owners for climbing and hiking. 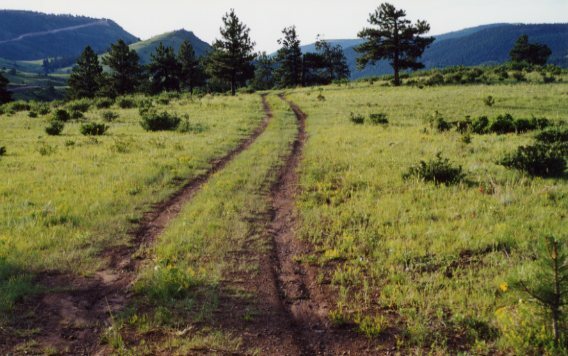 An old “pickup trail” crosses the property, providing a sure way to access all parts of the land. The trail leads to some of the prettiest parts of the property, and would become the driveway to a home site. 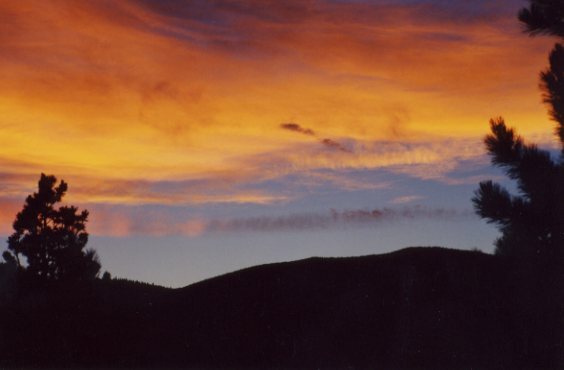 Sunset at South T-Bar, taken from the camp site seen above. 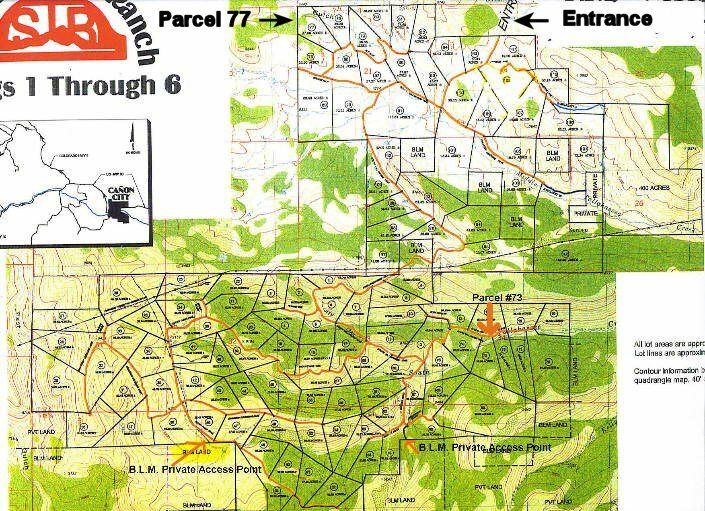 This map shows the northwest corner of South T-Bar Ranch with parcel 77. You can see the pickup trail and the creek. Click the Larger Map link to see the entire South T-Bar layout, including the entrance. 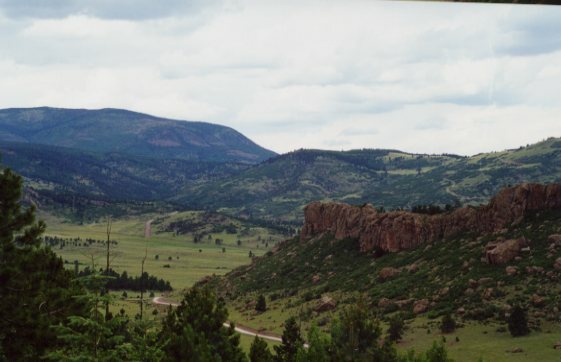 South T-Bar Ranch is located 45 minutes and 35 miles northwest of Canon City, Colorado. With good roads, no serious mountain passes, and limited snowfall, Colorado Springs, with its airport and entertainment, is little more than one and a half hours away. Breckenridge is an easy drive north on highway 9. Cripple Creek is just a small distance away. In short, all sorts of activities and entertainment, from river rafting to skiing to gambling and dinner, are readily available. 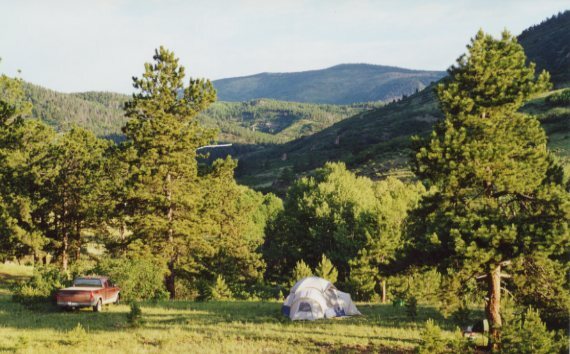 South T-Bar Ranch is one of Southern Colorado’s most pristine and unspoiled valleys in the Arkansas River Valley. It has one of the largest populations of elk, antelope, and other wild life in the state. There are nearly 75,000 acres of Bureau of Land Management land, on and near South T-Bar for hiking and horseback riding. With more than 320 days of sunshine per year, South T-Bar is truly heaven on earth. 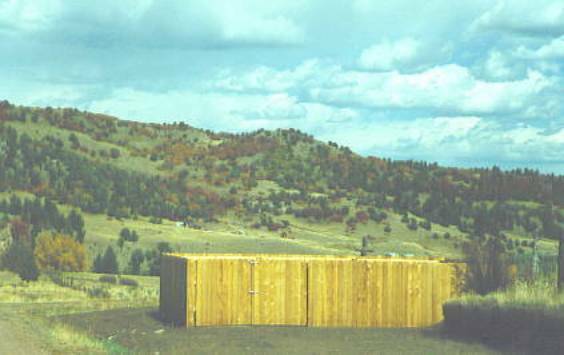 South T-Bar Ranch consists of 112 parcels of land, the smallest being 35 acres, and the largest grassland parcels exceeding 200 acres. South T-Bar has an active Property Owners Association and Board that handles road maintenance, garbage service, fire protection, and much more. You can visit the South T-Bar website. 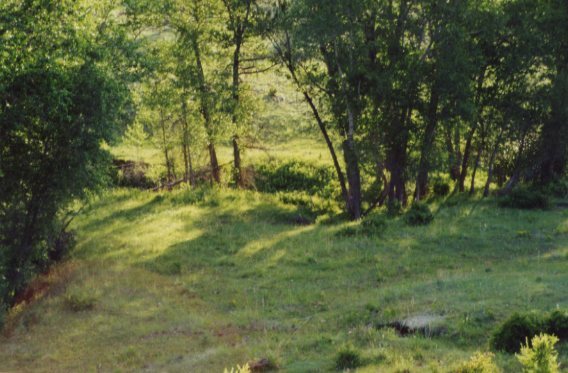 South T-Bar Ranch has minimal building covenants to protect your property values and to insure that the pristine nature of the valley is protected. You can view the covenants at the Building Covenants link. Additionally, the South T-Bar bylaws restrict certain kinds of activity such as sheep farming, running a construction business, or storing vehicles and equipment on the land. Again, the intention is to protect the beauty of the valley, maintain its pristine quality, and prevent the introduction of obnoxious business activities that would affect property values. South T-Bar has onsite firefighting equipment with a heated garage, and multiple water tanks placed throughout the property for fire fighting purposes. The nearly 26 miles of roads on South T-Bar are graded regularly, and plowed in the winter. Regular trash service is provided with bear proof containers kept in a fenced off area by the main gate. Why Buy At South T-Bar Ranch? Ø A secluded, beautiful mountain valley that is off the beaten path, and yet has year round ready access to shopping, airports, and recreation. 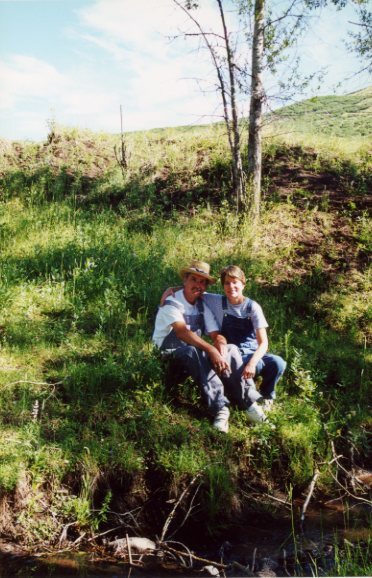 Ø Well maintained roads that are plowed in the winter, insuring year round access to all parts of the ranch. Many visitors remark that the South T-Bar roads are in better shape than many county roads. Ø On site fire protection provides peace of mind and reduced fire insurance premiums. South T-Bar is protected by the Tallahassee Volunteer Fire Department. Ø Underground electric and power lines keep the valley in a natural looking state. Ø Restrictions and building covenants to insure that your property values are maintained and that your neighbor’s property doesn’t become a nuisance, or worse. Ø An active property owners association that takes care of problems in a timely fashion. Ø All at a price far more reasonable than the “hot spots” in the state.